Makes cleaning pads fast and easy while conditioning and preserving them for future use! Quality buffing pads are a key factor in producing quality results for any detailing project. 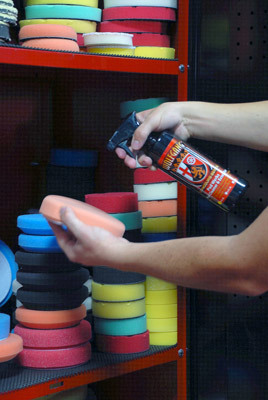 As your hobby or business continues to grow, so does your collection of buffing pads. Buffing pads are an investment and Wolfgang Pad Werks Pad Cleaner & Extender ensures maximum operating life from buffing pads of all types. 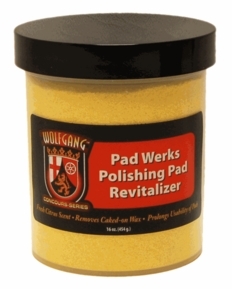 With Wolfgang Pad Werks Pad Cleaner & Extender, you can clean and condition your buffing pads to keep them clean, maintain performance, and be ready for the next detailing project. Mist Wolfgang Pad Werks Pad Cleaner & Extender liberally onto face of buffing pad and allow to penetrate and emulsify compound and polish residue for 45 seconds. Work Wolfgang Pad Werks Pad Cleaner & Extender into the pad by squeezing it or using a pad conditioning brush. Rinse pad in running water to remove compound and polish residue. Spray a light mist of Wolfgang Pad Werks Pad Cleaner & Extender onto the face of clean pads after rinsing and then store upside down in a well ventilated location free from airborne dirt and dust.